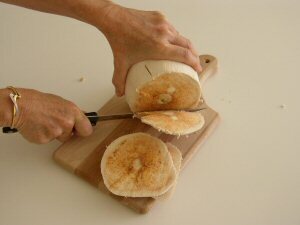 What moist and fresh young coconuts look like. 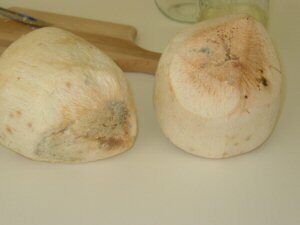 Examples of old, moldy coconuts: The water inside may still be fine to ferment. 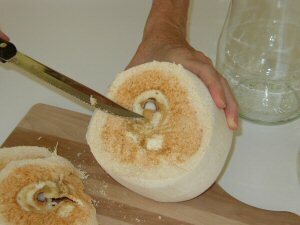 Lay young coconut on its side and cut several thin slices from the bottom. A circle appears (often white, sometimes a brown ring). This indicates the soft spot or way into the sterile, sweet coconut water. 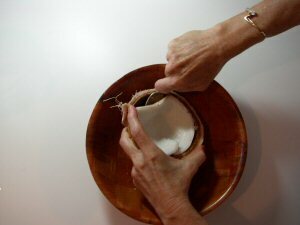 Sometimes a hard knot makes it more difficult to cut through the coconut. 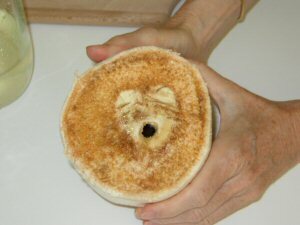 Usually the hole is in or beside this knot. 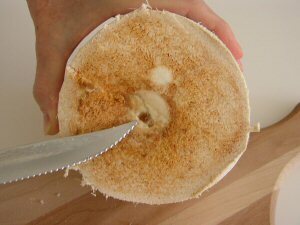 Poke down through soft spot, creating a hole in the coconut shell. 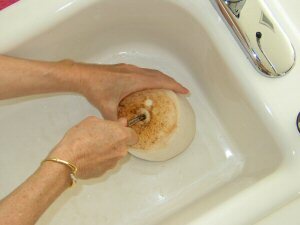 Setting the coconut down into a sink, so "cone-shaped" head nestles firmly into drain makes this easier. 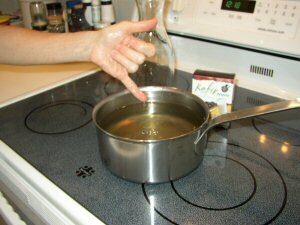 Widen the hole with a carrot peeler, so water can pour out. 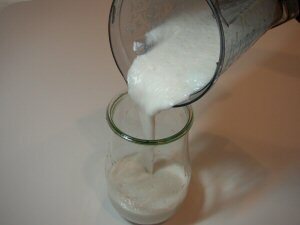 Each coconut contains 1½ cups of liquid. 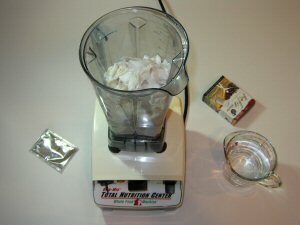 Open 3-4 coconuts to obtain 1½ quarts. 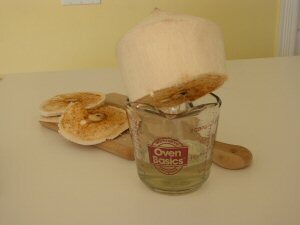 Pour Coconut Water through strainer into sauce pan. 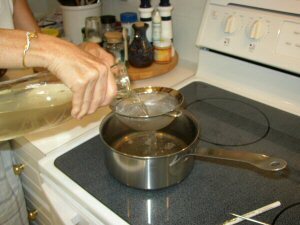 Ideally, Microflora prefer that the liquid be 92° F (31° or 32° C), so be careful not to overheat. Use an inexpensive thermometer if desired, to check the temperature. 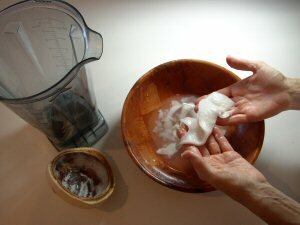 Or wash your hands well and dipping your finger into the coconut water, test for the right temperature. At 92, you won't feel hot or cold. It will be a neutral feeling or "natural feeling". 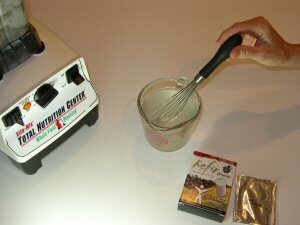 Add Body Ecology's Kefir Starter or Body Ecology's Culture Starter to the heated coconut water. 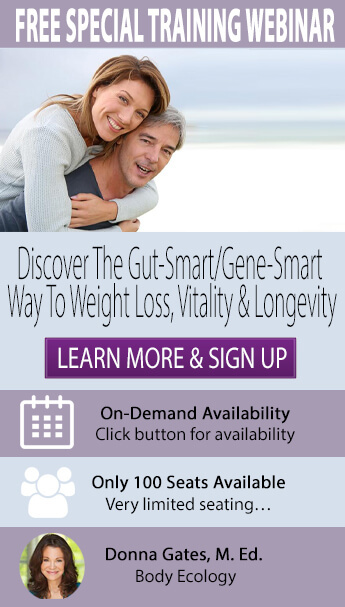 The culture starter contains plantarum, an antiviral bacteria, and the kefir starter contains lactobacillus and beneficial yeast. 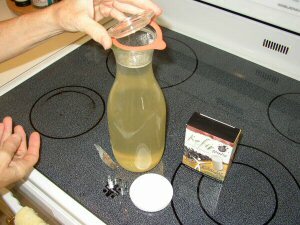 Put lid onto glass container and shake well!! Ideally the room temperature should be around 70°F to 75° F). 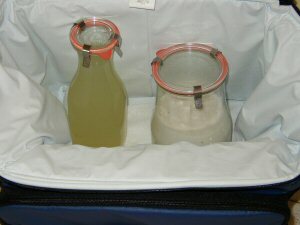 If your room is colder you may want to place glass container into insulated storage. 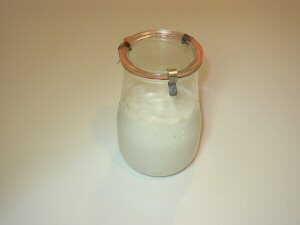 Kefir is ready in 36 hours (may vary with temperature). 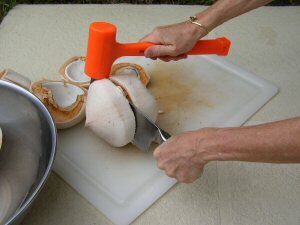 Useful tools for splitting the coconuts. 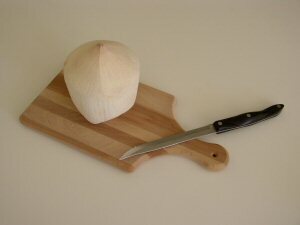 Strike the coconut with the cleaver to get started. 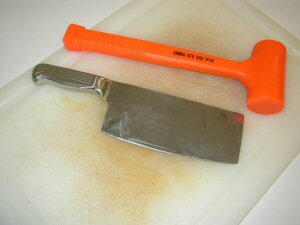 Then strike the end of the cleaver repeatedly, driving it almost all the way through the husk. The coconut on the left has a nice white color to the meat, whereas the meat on the right is turning gray in color and should be discarded. 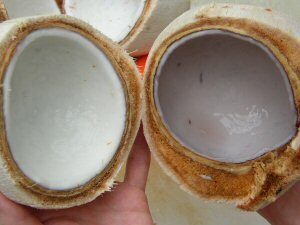 Note that pink coconut meat has not gone "bad" — pinking in coconut water and meat is not harmful or related to hygiene, bacteria, or contamination. 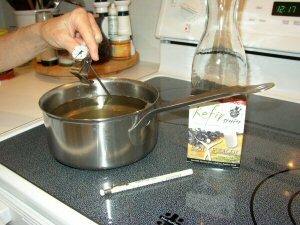 Phenolic-antioxidant compounds, naturally found in plants, may react with the enzymes in the coconut to turn water and meat pink, in some cases. Rinse any brown skin off of the soft white meat. Lace in a blender and puree with enough water to create the consistency of a creamy pudding (you may use water or coconut water). 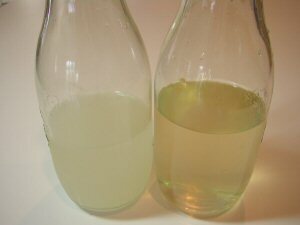 Dissolve the kefir starter in warm water (you may add EcoBloom if using regular water to aid in fermentation). 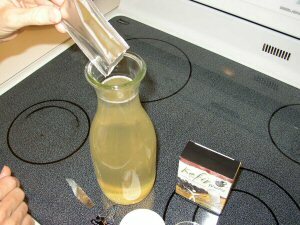 Pour mix into a glass container. Put a lid onto the container. 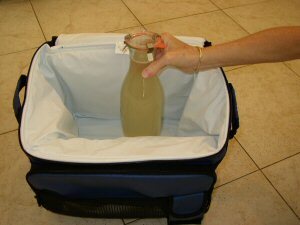 Place container into an insulated container if necessary.